Dinner plate, white with royal blue and gold patterned/gilded rim. 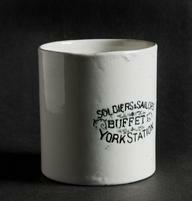 Made by Royal Worcester - Hotel Ware. Stamped on base 'W5/B1'. Overall: 26 mm x 228 mm.